Simply slides into your existing 2" hitch and connects with your standard hitch pin! Made with pride in New York State! Use our #3 style on the front of your truck! Shown here is a Ford set-up to carry 2 kayaks. A Q-Tower rack on the cab with Mako saddles and our Deluxe #3 rack with Hulley Rollers on the Rear. Ready to carry two new kayaks home and maybe a couple mountain bikes next weekend! Both front and rear racks shown here remove in seconds without tools. Our customers like the #3 style because it is so simple and quick to take on and off. The #3 style works great for one canoe or up to two solo kayaks. Our #1 and #2 styles can carry more gear at once since wider cross bars are available. These are unlike some of the competitors racks that are nothing more than common angle iron that wobbles and shimmys all over since peices are just pinned together. Oak Orchard's racks are all powder coated, 2" square HD American steel uprights topped off with a hardened steel, plastic coated bar that is compatible with all Yakima accessories! The only wiggle you get on our #3 style rack is from the reciever itself. We've included two stabilizer straps to minimize this. Click here to view Deluxe Style #3 instructions. 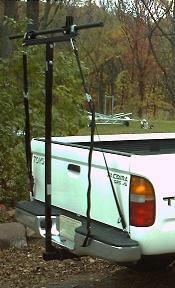 Both versions of our #3 Truck Rack offer Adjustable height for any truck! The Deluxe # 3 rack is about 58" tall and the basic # 3 rack is about 59" tall. Each of these can be adjusted about 4.5" higher if needed. the Style #3 Rack that fits your vehicle and your needs.